Sit in the proper position keeping your back straight and your shoulders back. Distribute your body weight evenly on both hips, and keep your feet flat on the floor. Arrange your work space so that it is close to you. Ensure there is proper padding if leaning on hard surfaces. Work with elbows in close proximity to the body. Work with wrists in a straight and neutral position. Adjust and/or elevate your chair, workbench, or microscope as needed to maintain an upright head position. 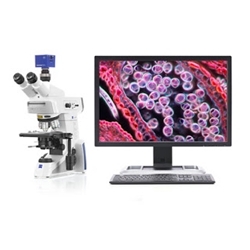 Adjust microscope eyepieces or mount the microscope on a 30° stand for easier viewing. Repair and clean microscopes regularly. Learn how to clean lenses here. If possible, spread microscope work throughout the day and between several people. Schedule works breaks. Every 15 minutes, close your eyes or focus on something in the distance. Every 30 minutes get up to stretch and move. Microscopy is a demanding and rewarding field to work in. By maintaining an ergonomic work space you can ensure years of healthy and pain-free work. "Tips for Microscopy." Laboratory Ergonomics. Ergonomics.ucla.edu, 2012. Web. 27 June 2017. "Posture for a Healthy Back." Articles. Health. Clevelandclinic.org, 2017. Web. 27 June 2017.